This is Jalie 2449, the popular crossover top pattern. I’ve made it twice before, both times out of a very stretchy two-way stretch knit. 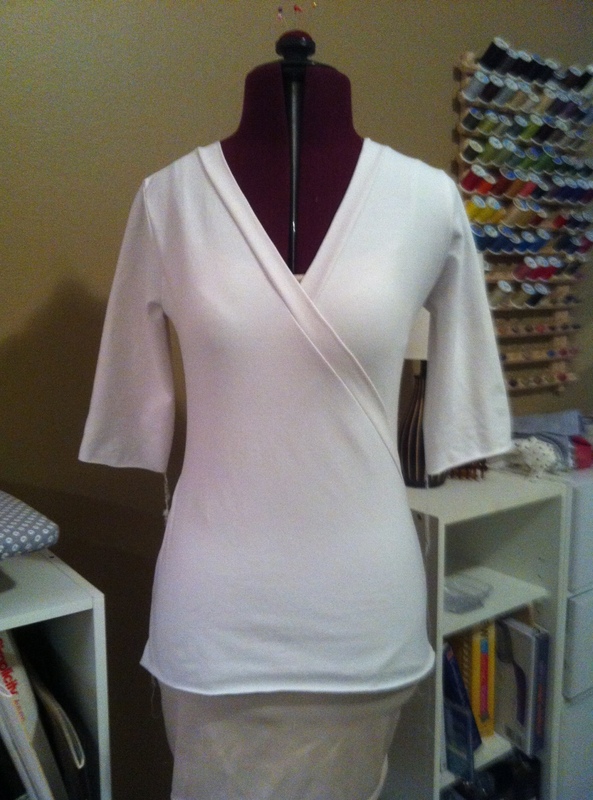 This time, I used a moderately stretchy cotton knit that’s great for t-shirts. The lesson? Don’t expect fabrics with different qualities to behave the same just because you’re using the same pattern. You can’t tell what’s wrong with it on the dress form, because it fits Headless Hannah very nicely. On a moving, breathing body, though, the seams at the waist where the bands attach pull the seams into a very weird/foldy/pleated thing on both sides. My first thought was that I had made the bands too short, but they feel right and keep the crossover hugging the body. If they were any looser (in this fabric in particular), I’m pretty sure the neckline would gape. I think now that I just need to cut the fabric wider just at the waist. The shoulders and hips still work, so I need to somehow loosen the pressure at the sides. Not sure how I’ll reconcile the “grip” of the neckbands so that they still hold the front close but don’t cause the problem to happen again. Can’t bat a thousand at sewing, and probably never will! It comes with the territory and that’s fine with me.